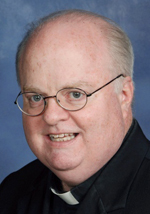 Father John C. Crowley, 52, pastor of Sacred Heart Parish in Oxford, died suddenly on Dec. 31. The son of the late John C. and Jean E. (Ryan) Crowley, he attended St. Charles Borromeo School in Drexel Hill, Msgr. Bonner High School and Drexel University, followed by a decade-long career as a Certified Public Accountant. He entered St. Charles Borromeo Seminary in 1998 and was ordained May 18, 2003 by Cardinal Anthony Bevilacqua at the Cathedral Basilica of SS. Peter and Paul. His first assignment was as parochial vicar at St. Alphonsus Parish, Maple Glen. He then entered graduate studies at the Pontifical Gregorian University in Rome where he received a Sacred License in Theology with a specialization in dogmatic theology. He taught part time at St. Charles Borromeo Seminary and served as parochial vicar at Our Lady of Mount Carmel, Doylestown, and St. Bernadette of Lourdes, Drexel Hill. He took up his duties as pastor of Sacred Heart in southern Chester County just two months ago. His death at his rectory came as a shock to the parish, where he was well liked in his short term as pastor, according to Father Joseph Shenosky, who performs weekend ministry at Sacred Heart, and knew Father Crowley well. Msgr. Paul Dougherty, who preached at Father Crowley’s first Mass, first met him when he was assigned to St. Charles Parish and Father Crowley was still a high school student. “Growing up we played a lot of sports together; we were very involved in hockey, track and basketball,” recalls his brother, Michael. “He did well in school and his work, he put his heart into everything he did. I was a little surprised when he told us one day he had a calling. He was very kind and he put his heart into whatever he did. Father Sean O’Neill, who will preach at Father Crowley’s funeral Mass, was a seminary classmate and has remained a good friend ever since. He recalls Father Crowley really started his formation at a Carmelite foundation but transferred to St. Charles when he realized his call was to be a parish priest. “We would get together almost every week,” Father O’Neill said. “He was a humble guy, but very passionate about being a priest. He was a good friend and you always knew where you stood with him. Although he was pastor of Sacred Heart for a very little time, “in a way he will never leave the parish,” Father O’Neill said. There will be a viewing for Father Crowley at Sacred Heart Church on Sunday evening, Jan. 8, from 4:30 to 7 p.m. followed by a parish Mass. There will also be a viewing beginning 9 a.m. on Monday, Jan. 9, followed by his 11 a.m. funeral Mass celebrated by Archbishop Charles J. Chaput. Father Crowley is survived by his sisters Kathleen Salute, Susan O’Neill (John), Ellen Shea (Patrick) and his brother Michael and many nieces, nephews and grand-nieces. Interment will be in Calvary Cemetery, West Conshohocken. So sad with the death of Father Crowley because he was a priest who enjoyed his vocation and touched the lives of many. God bless a good priest as he is called to heaven to intercede for us who are still struggling here on earth. So sorry and saddened by the loss of Father John Crowley. Remember him well when I worked in the Theologate at SCBS. Fr. John taught in our Diaconate Formation Ordination Class of 2015 at St Charles Seminary Wynnewood/Overbrooke. We will never forget Fr John and what he taught us not only in class but ther way he lived his life, an example, as a true holy and humble priest! Eternal rest grant to him , O Lord, and let Eternal Light shine on Fr John, May his soul and all the souls of the faithfully departed Rest In Peace, AMEN!